Positively Living LFS, It’s NOT a Death Sentence. Odds are that Li-Fraumeni Syndrome is THE most devastating hereditary cancer syndrome that you have never heard of, unless of course you know one of our families or you have had the misfortune of being recommended for genetic testing for a TP53 mutation. Odds are also that if you ran across an LFS family on the street, you wouldn’t know it- but pay attention. They are the ones living life to the fullest DESPITE the risk of cancer. Learning you have Li-Fraumeni Syndrome can be one of the most devastating diagnoses a person can hear. It is overwhelming to learn that you may have more than a 90% chance of getting cancer in your lifetime. That you could or may have passed this gene along to your children. It is tough information to process. Diagnosis unfortunately often comes on the tail end or during treatment for cancer. Often other family members have or have had cancer as well, which is one of the reasons someone might be tested. I am not talking one or two cancers, I am talking about dozens of cancers. There are strict criteria that are followed before genetic testing is recommended. There are still many doctors who are completely unaware of LFS. There are many families who fit the criteria who have never been recommended for testing who might benefit from it. Yet so many who get the diagnosis find relief in knowing that it is not a curse. It is not something they “did”. The diagnosis although daunting gives them information to make better decisions about their health. It helps them to live better. Somehow, despite the diagnosis, the risk, families with LFS persevere and choose to live the positive rather than fixate on the negative. When a newspaper publishes a sensational article about a false positive genetic test of Li-Fraumeni Syndrome and how devastating it is to the woman who thought for 7 months she had LFS and was going to die, our community takes the shot. Although we have plenty to complain about- rare are the complaints. Our community is stocked with strong fighters who are Living LFS. When a woman sues over the false positive- which is absolutely a thing that happens- despite the misinformation given to her by her doctor- it hurts our community. It also highlights several problems. There is not enough awareness of this rare condition. There are doctors giving out incorrect information and ordering genetic tests without the proper information and follow up with appropriate specialists, like genetic counselors. I do not know the details of the lawsuit, but I do know that the article incensed our community. Mistakes do happen and there are consequences. Sometimes the collateral damage is significant. Yes this woman had 7 months of thinking she had a cancer syndrome, which at the end of the day she does not. We are sympathetic to this emotionally as we have hundreds of families who know they have the syndrome. The damage is to our community. We struggle to get adequate screening and care because the syndrome is so rare that most physicians have no idea it exists. The damage is to the people who actually HAVE the syndrome and can not pass this off as 7 months of anguish. True strength is knowing you have this syndrome and choosing to live while constantly advocating for your own health care. Thank you to Brandy Ries for expressing how it feels to be living LFS. 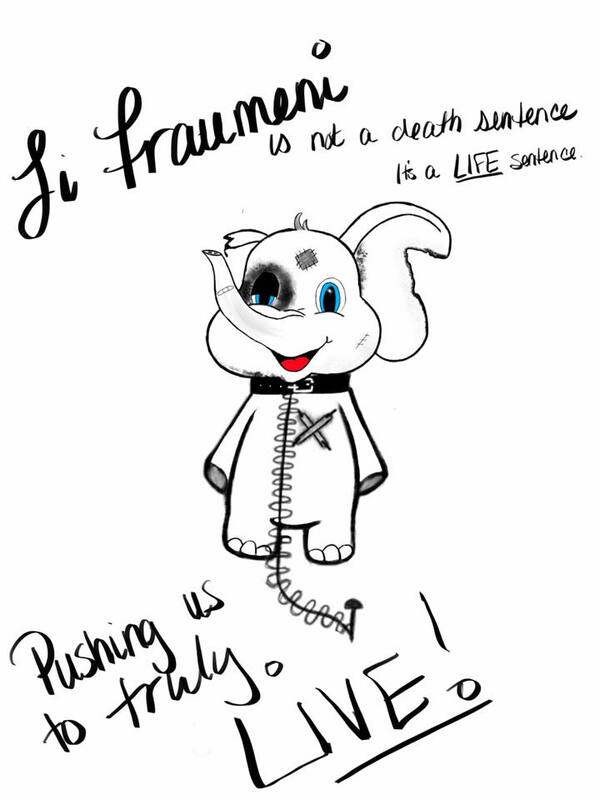 Li-Fraumeni Syndrome is not a death sentence. No one gets out of this great big adventure in life without dying. Li-Fraumeni Syndrome is a hereditary cancer syndrome. Some families get heart disease. Others live with diabetes or severe metabolic conditions. Our risk of getting cancer is significant. We can pass along the gene to our children. Not everyone with LFS gets cancer. We have a vibrant strong support group online of individuals who not only have LFS but are living with this syndrome. They fight for awareness, they advocate for their care and their children’s care. They face extensive medical bills. They spend inordinate amounts of time trying to get screening covered. They do so with grace and strength and a whole lot of laughter. We affectionately refer to ourselves as mutants. We get scanned, poked, prodded, cut and joke about expendable body parts. We have members who are students and professionals and scientists and artists. We have lawyers, doctors, nurses. We have teachers and equestrians and dance instructors. We are a cross section of society and are represented in countries all over the world. We may not have huge numbers or be a public health threat, but our history and genetics are significant to the war on cancer. Over 50% of all cancers, in normal people have mutations in p53- a protein that tells cancer cells to stop. These cancers can’t be passed along- they are in cells, tumors. We unfortunately have the p53 mutation in all of our cells- so at any given time cancer could pop up in any of our parts. It is also in our germline cells- meaning we can pass it along to our children. Through it all, we cope and carry on. There is hope in our genes. Unraveling a major mystery of cancer is in our genes. You just have to find it. Like the positive side. We do not wish this syndrome on anyone, as you would not wish someone to be in a car accident or be accidentally injured. When one of our LFS family members tests negative, we celebrate with them. It is a time we encourage negativity. We want more people to be negative for LFS. When members test positive, we help with resources and support needed as they adjust. It is an adjustment. Yet there is so much misinformation and confusion out there as exhibited by the recent New York Post Article entitled Doctors Gave Me a Death Sentence After Genetic Mix Up. A woman was told she had Li Fraumeni Syndrome and that her chance of getting cancer was nearly 90% and she would just keep getting cancer until she would die. There is no need to sensationalize a syndrome like LFS. We would like to clarify a few points. LFS is not a Death Sentence. It is a Life Sentence. Knowing you have the TP53 mutation that causes LFS is vital to making preventative screening, treatment and health decisions. We are sensitive to radiation. This is a huge consideration in cancer treatments. Many chemotherapies are also cytotoxic and do not work as well with mutant p53. These are pieces of information needed for appropriate care and can change the effectiveness of treatment and quality of life. Knowing our status helps us make decisions day to day to help us stay healthy and give our bodies a chance to hold off cancer. False Positives are a real thing. According to Merriam-Webster, a false positive is defined as: relating to or being a test result or an individual that is erroneously classified in a positive category (as of diagnosis) because of imperfect testing methods or procedures <a false–positive pregnancy test> <… one must bear in mind the cost of needless medical procedures generated by the huge number of false-positive mammograms …—David Plotkin, The Atlantic Monthly, June 1996>. A false positive means a person was told they have a disease or condition when they do not. The test result is actually positive, it could result from a contaminated sample, a mixed up sample, or clerical error. There are safeguards in place and ways to avoid this. The chance of getting a false positive is estimated to be less than 1%. That tells me the companies are very good at what they do- I wish I had less than a 1% error rate on any given task. It tells me false positives do not happen often, but they can happen. According to a paper by Jhaveri et al, about the benefit and burden of cancer screening in LFS- regardless of family history, certain types of breast tumors and age at diagnosis are strong indicators for testing for TP53 mutations. If mutations in BRCA 1/2 and/or Lynch syndrome-associated genes have been considered and not found, screening for Li-Fraumeni syndrome may be appropriate. Table 2 lists guidelines regarding whom to test specifically for Li-Fraumeni syndrome. In general, the Classic and Chompret criteria can help identify families at risk for germline p53 mutation, though it is important to remember that negative results do not rule out a diagnosis of Li-Fraumeni syndrome if the personal or family history is suggestive of the syndrome [2,10]. While most guidelines generally suggest testing for TP53 mutations in families with classic tumor types (sarcoma, breast, adrenocortical carcinoma, and brain tumors) and with cancer onset < age 45, an important independent testing criteria for clinicians to recognize is that all women with early-onset breast cancer (age of diagnosis < 35), regardless of family history, should also be considered for TP53 mutation testing, particularly if the breast tumor is Her2-positive. Translation- there are many mutations that are linked to LFS. Some are not known. A negative test does not mean you do not have LFS. There is a condition called LFS-like- all the criteria are met, yet the genetic test is negative. A strong family history is an important indicator of risk. A young woman with no family history and breast cancer is a candidate for genetic testing for LFS. Especially if her breast cancer is Her2 positive. Sometimes genetics gets ahead of our understanding. We have a lot to learn about what causes cancer and LFS. Until we have more information- it is important to meet with qualified professionals if you have a significant family history of cancer and are concerned. Genetic counselors are excellent resources. It is true that there is not a lot of accessible information out there about LFS. Living LFS and other organizations are working to change that. We are happy to answer questions- our collective experience with LFS professionally and personally is extensive. Families with LFS spend a lot of time educating doctors and professionals on their condition. We learn to be our own best advocates. We do this day in and day out. It becomes part of our normal. It is a shadow that follows us, but we work hard to keep the light in front of us and move towards that. We have many passionate professionals who have dedicated their life’s work to helping our families get the screening and care we need as well as the research to support what is best for our community. They do not do it for financial gain- they do it for our incredible families. So before we vilify a group, a genetic testing company, we need to get our facts straight. What is the real issue here? The issue is not that one woman had a false positive. The issue is that the information given, although bluntly true- was not the entire picture or an accurate representation of the syndrome. The issue is that in the decades that this syndrome has been known- it still is not on the radar of many medical professionals meaning there are families out there at risk that haven’t been identified. There are families not getting the best information or being referred to the appropriate professionals to help them cope with the risk and emotional impact of this syndrome because it is rare. There are now families who were given positive tests who will demand retesting because of this statistical anomaly. There might be families who won’t get tested because they will not trust the results, because of this article. The issue is after decades- despite valiant efforts of multiple institutions around the world- there is no one screening regimen for LFS families that is a standard of care. The issue is LFS families struggle to get the care they need to live because the syndrome is so rare. Yes the syndrome can BE DEVASTATING but it doesn’t have to BE. THAT is the ISSUE. So while we fight cancer and advocate and support each other. While we try to change these issues for our children, we continue to live LFS. Please join us by spreading awareness, not misinformation. Get to know our families. Read some of our blogs, follow us on Facebook, Twitter, or Instagram. Give our special families a shout out so we know you support us and living LFS. “False–positive.” Merriam-Webster.com. Merriam-Webster, n.d. Web. 18 Sept. 2016. Jhaveri AP, Bale A, Lovick N, et al. The Benefit and Burden of Cancer Screening in Li-Fraumeni Syndrome: A Case Report. The Yale Journal of Biology and Medicine. 2015;88(2):181-185.